Over three days at the end of November, the three of us joined about 40 representatives of 18 Colombian organizations who had gathered in Subachoque, about an hour outside Bogotá. 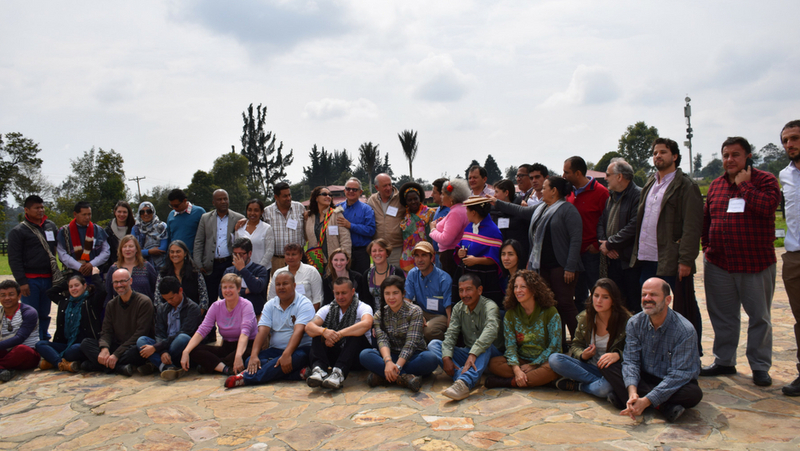 They had traveled from 16 departments across Colombia to consider how best to come together to advance peace in the communities where they live and work. It was a diverse gathering of people by race, ethnicity, gender and age. The 18 organizations are also diverse. Some are cooperatives, associations or non-governmental organizations dedicated to improving rural livelihoods or local territorial development. Others are professional networks that promote the leadership of women or young people or advocate for government transparency or LGBT rights. Many carry out their work in rural areas while others are urban. Only one, a noted Colombian research center, has a primary focus on peace, though all have felt the effects of the country’s 50-year armed conflict and the violence that has unfortunately become part of reality in so many communities. How did such a varied group come together, and what is the unifying thread that binds them? All 18 organizations are current or recent IAF grantee partners selected from among 30 groups we invited to submit a proposal on how to integrate peace-building activities into their work. Rather than treating the proposals as separate and unconnected projects, the IAF asked each organization to commit to joining together to build a grassroots peace network. In doing so, they will multiply their efforts and impact by powering peer-to-peer learning and collaboration. The gathering in Subachoque was designed to allow everyone to get acquainted personally and learn about each organization — including its primary mission and activities, strengths and challenges — and each of the 18 peace projects they will soon implement. As is so often the case when the IAF’s grassroots partners gather, the room felt charged with energy. Common interests became readily apparent, and differences in personal experience, background or geography were easily overcome. By the end of the second day, participants came to see themselves as integrating a peace system with a personality distinct from any of the individual organizations. They realized there’s an opportunity to have an impact beyond the specific results expected from each project. In fact, some groups began to discuss the possibility of carrying out project activities together, especially those located close to each other and pursuing similar objectives. Many are planning to visit each other’s communities to deepen understanding and to broaden engagement by including a wider circle of active participants. The group will also take advantage of curated space on RedColaborar, the IAF’s partner engagement platform. This will be a place to continue the conversations begun in Subachoque, to plan collaborative efforts and to involve more people from both inside their ranks and in their wider communities. Those registered on the platform can upload documents, videos or short learning opportunities; pose and answer questions; and react to each other. The space will also include posts with important news and analysis about the peace process so that all subscribed are up-to-date on the latest national developments. Videographers, who joined us in Subachoque and will be visiting communities over the next several months, will document the experience. We will post short video clips on the IAF website and elsewhere as they are available. Look for a full-length documentary at the end of 2017. One of the 18 organizations, the Centro de Investigación y Educación Popular (CINEP) specializes in systematizing peace processes, and that will be their role within this initiative as well. This will help us all reflect on the experiences in each community, identify the different strategies for peace-building and understand how they fit among other peace initiatives in Colombia. The systemization will also help us share our findings with a broader audience in Colombia and elsewhere. A community manager will help curate the initiative’s virtual space on RedColaborar. The manager will facilitate engagement for the 18 organizations by posting relevant news or analysis, by calling attention to thematic connections and areas ripe for collaboration and by providing assistance to participants who face challenges with internet connectivity or digital technology. The community manager will also play a critical role in gathering feedback on RedColaborar itself so we may continue to improve the tool. The IAF’s country team will be attentive to identifying possible connections between the grassroots peace initiative and the rest of the IAF’s programs in Colombia and Latin America so that we may take advantage of important synergies as they arise. On our last day together, cell phones began to buzz with breaking news headlines that the Colombian Congress had ratified the peace accords. It was incredibly gratifying to learn of this development as a group together in Subachoque. This moment underlined the timeliness and relevance of our initiative. More personally, the three of us left Subachoque energized by the dynamism of our partners who bring such deep and thoughtful experience to this historic opportunity for Colombia. We are passionately committed to supporting them in their efforts.